The European Union (EU) has mandated the General Data Protection Regulation (GDPR) to reinforce data protection rights of individuals by replacing General Data Protection Directives, 1995 w.e.f 25 May 2018 in the each of 28 EU member states. The Government of India had constituted a Committee of Experts to study the various issues relating to data protection in India and make specific suggestions on principles to be considered for data protection in India and suggest a draft Data Protection Bill. The objective of ongoing researches, drafts, white papers and workings of IT and legal experts in the government as well as private sector stakeholders is to ensure the growth of the digital economy while keeping personal data of citizens secure and protected. In this backdrop, the draft regulatory mechanism and legal framework for data protection in India are yet to be set forth for majority consensus and constitutionalisation. 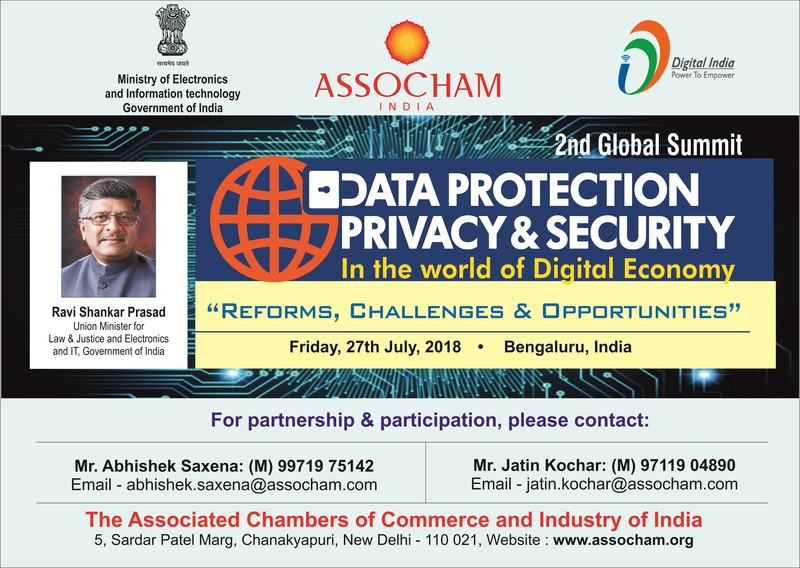 Considering various significant aspects of GDPR towards aligning the requirements of India’s data protection and privacy laws as well as equipping the stakeholders on appropriate technical and organizational measures, and compiling their comprehensive views, the ASSOCHAM has very successfully organized the first Global Summit at New Delhi on 11th May 2018. The summit was graced by Mr. Devender Kumar Sikri, Chairperson, Competition Commission of India, Mr. Suresh Chandra, Law Secretary, Department of Legal Affairs, Ministry of Law and Justice, Mr. Gopalakrishnan S., Joint Secretary, Department of Electronics & Information Technology, Government of India and several eminent speakers and participants from India and abroad. Southern region of the country plays a very crucial role in the IT industry of the economy and the stock of perspectives, views and experiences from the region would be a milestone for India’s data protection and privacy laws, therefore, to discuss and deliberate upon the various issues and accordingly level-up the advancement for detailed suggestions and responses to the government on this highly significant subject, the ASSOCHAM is organizing the 2nd Global Summit on “Data Protection, Privacy & Security – Reforms, Challenges & Opportunities-” on Friday, 27th July 2018 in Bangalore, India. The summit aims at inviting views and suggestions from a multi-stakeholder community on the regulatory and judicial processes, and submit the same for consideration by the government in building an Indian data protection law and process of reforms in the interest of development of a strong and contextually relevant data protection framework.